You've made a great impression with your application and resume. Now you've made it to the interview stage. Congratulations! Confirm your interview time and know exactly where you're going. Explore the dress code requirements of the company and select your interview attire accordingly. Research the company's culture and business practices so you can be clear about how well you will fit in. Prepare copies of your resume and a reference list to take with you - just in case. Now all you need are a few additional tools that keep you comfortable and confident in the presence of interviewers. Granted, you probably have experience in being a good social guest. Aren’t the etiquette skills you use when you go to dinner at someone’s house basically the same? Actually, no. They show the same respect and concern for others, of course, but using a different mode of expression. Everyone appreciates a confident person. When meeting with a potential employer, you express your strengths in an honest, straightforward way, unembarrassed by discussing your accomplishments. In the social scene, however, you wouldn't be so open about discussing your accomplishments. You might share, in the form of good news, a success you've experienced and, when someone congratulates or brags about you, demurely accept the compliment with thanks. A confident dinner guest plays his role at the table by engaging in lively conversation, yet conviviality in a job interview might be out of place. A confident interviewee conveys that confidence with straightforward replies, tactfully steering the conversation away from an interviewer getting too personal. When a person is enthusiastic socially, he shows up eager for what comes next and ready to appreciate it. He’s interested in others and enjoys hearing what they are up to. It’s this zest for life that makes a person eager to express his individuality. Have you ever noticed a person’s eyes who is in this mode? Often wide open, penetrating. It’s a look of vitality and openness: delightful! Professionally, a potential employee demonstrates enthusiasm by her interest in the company, knowledge of the industry in general, and demonstrates strengths as a team player. The eyes have it here, too. Direct eye contact with an interviewer may not be described as “delightful,” but would be a mirror of your knowledge, confidence, and work ethic. Direct and focused eye contact are accompanied by to-the-point answers. Meandering a little may be fine socially, but professionally, a potential employee focuses on practicing ahead of time giving short, but complete answers and examples. Etiquette is your guide in any situation, including a job interview. 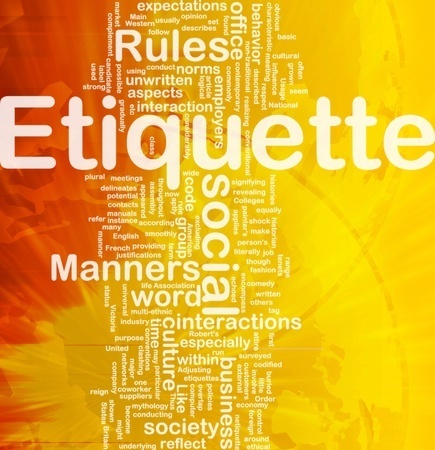 Being etiquette-ful means that you seek the most respectful and courteous way to interact with others. Communication is paramount as you fully understand where you are and what a situation calls for. This applies whether in a social or professional environment. What are other qualities you can demonstrate in a professional interview? Honesty expresses itself by being explicit about exact accomplishments. And, if asked about limitations, you provide answers that don’t hide hesitations, or areas of the potential position that you don’t yet feel confident about. Preparedness for the new work will show up in your qualifications, generally. But some potential employers want to see how you handle yourself in social situations that require a professional presence, such as dining with others at a business lunch or dinner. Brushing up on your table manners and dining etiquette, your knowledge of table settings, use of utensils, and appropriate table talk will be helpful. Authenticity is something that’s no different socially than professionally, including interviews. Being your honest self means showing up as the competent person you are — someone with a great attitude, zest for life, and ready to work with a great company. 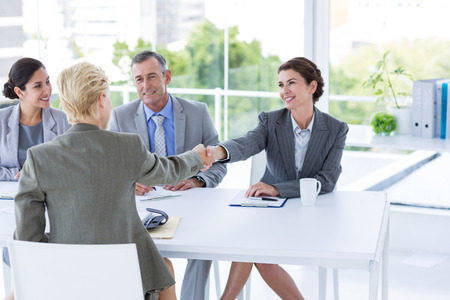 Smiling during an interview with the posture of a person who is eager to work and moving forward (whether or not that company hires you or not) is the impression you want to leave. Once you’ve made a great impression, following up with a thank-you note is essential. It’s your personal signature of integrity.